Fire brigade - dump truck (MB), 1973. Driver's cab red with transparent blue warning light inserted in red base. Chassis, Cardan part and search light black, interior anthracite grey. Radiator grille black with silver-painted Mercedes-Benz star. Bumper headlamps and searchlight hand-painted in silver. Ramp black, skip red with silver base insert. Wheel rims in black. 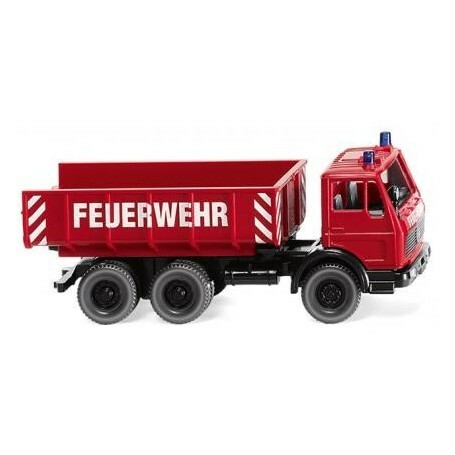 'Feuerwehr' lettering on front of the driver's cab. Skip imprinted with warning lights and 'Feuerwehr' lettering on the sides.